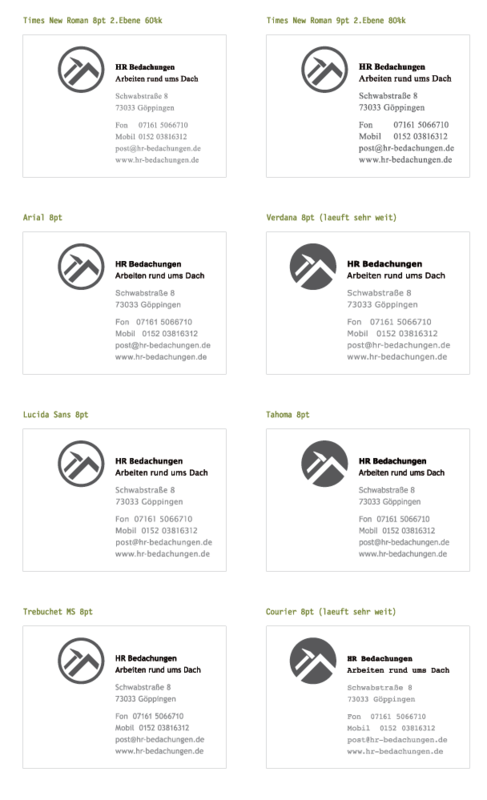 / Graphic / Corporate Identity / "HR Bedachungen"
Ein Bekannter fragte an, ob ich ihm bei seiner Existenzgründung etwas unter die Arme helfen könnte. Tja, und da ich keine Dächer decken kann HARHARR, tat ich, was ich am besten kann und entwarf für ihn ein Erscheinungbild. Berlin is the capital city and one of 16 states of Germany. With a population of 3.4 million people, Berlin is Germany's largest city. It is the second most populous city and the eighth most populous urban area in the European Union. Located in northeastern Germany, it is the center of the Berlin-Brandenburg Metropolitan Area, comprising 5 million people from over 190 nations. Geographically embedded in the European Plains Berlin is influenced by a temperate seasonal climate. Around one third of the city´s territory is composed of forests, parks, gardens, rivers and lakes. First documented in the 13th century, Berlin was successively the capital of the Kingdom of Prussia (1701–1918), the German Empire (1871–1918), the Weimar Republic (1919–1933) and the Third Reich (1933–1945). During the 1920s, Berlin was the third largest municipality in the world. After World War II, the city was divided; East Berlin became the capital of East Germany while West Berlin became a Western exclave, surrounded by the Berlin Wall (1961–1989). Following German reunification in 1990, the city regained its status as the capital of all Germany hosting 147 foreign embassies. Berlin is a major center of culture, politics, media, and science in Europe. Its economy is primarily based on the service sector, encompassing a diverse range of creative industries, media corporations, congress and convention venues. Berlin serves as a continental hub for air and rail transport, and is one of the most visited tourist destinations in the EU. Other industries include optoelectronics, traffic engineering, IT, renewable energy, pharmaceuticals, biomedical engineering, and biotechnology. The metropolis is home to world-renowned universities, research institutes, sporting events, orchestras, museums and personalities. The urban and historical legacy has made it a popular setting for international film productions. The city is recognized for its festivals, diverse architecture, nightlife, contemporary arts, extensive public transportation networks and a high quality of living. Berlin has evolved into a global focal point for young individuals and artists attracted by a liberal lifestyle and modern zeitgeist. In marketing, a corporate identity is the "persona" of a corporation which is designed to accord with and facilitate the attainment of business objectives. It is usually visibly manifested by way of branding and the use of trademarks. Corporate identity comes into being when there is a common ownership of an organisational philosophy that is manifest in a distinct corporate culture — the corporate personality. At its most profound, the public feel that they have ownership of the philosophy. In general, this amounts to a corporate title, logo (logotype and/or logogram), and supporting devices commonly assembled within a set of guidelines. These guidelines govern how the identity is applied and confirm approved colour palettes, typefaces, page layouts and other such methods of maintaining visual continuity and brand recognition across all physical manifestations of the brand. These guidelines are usually formulated into a package of tools called corporate identity manuals. Many companies, such as McDonald's and Electronic Arts, have their own identity that runs through all of their products and merchandise. The trademark "M" logo and the yellow and red appears consistently throughout the McDonald's packaging and advertisements. Many companies pay large amounts of money for an identity that is extremely distinguishable, so it can appeal more to its targeted audience. The Nelson Mandela State International School Berlin was founded in 2000 by the government of Berlin. It currently enrols students from year 1 through year 12. 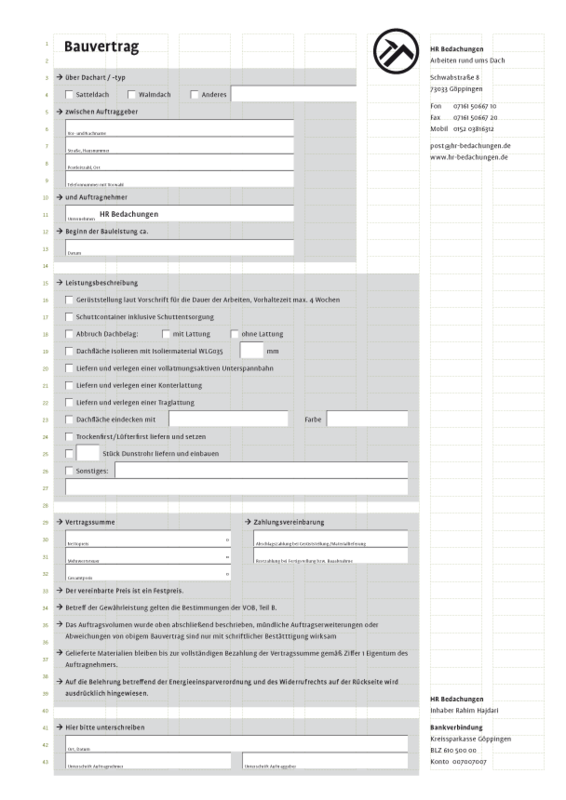 At the end of year 10, NMSISB students qualify for the various German lower secondary school-leaving certificates. At the upper secondary level the school offers both the bilingual German Abitur and the International Baccalaureate (I.B.). The IB is an internationally recognized graduation program. Only schools that meet the IB- requirements (such as teacher training, library, school band and other school facilities) are allowed to offer the IB certificate. The Nelson Mandela State International School is also a member of the European Council of International Schools. The Nelson Mandela School provides quality bilingual education to children from a wide variety of backgrounds. English and German are our school’s official languages, but we do not stop at introducing our students to just German and Anglo-American values and traditions. As a truly international school, it is our business to acquaint our students with as many different cultures and value systems as possible and to enable our students to make a positive difference wherever they go. The house system is a traditional feature of British schools, and schools in ex-British colonies. Historically it was associated with established public schools, where a 'house' refers to a boarding house or dormitory of a boarding school. The famous Bishop Cotton School in Shimla, India which was founded on 28 July 1859 was one of the first public schools in the world to start the House System, the Prefectorial System and organize games and sports in public schools as part of their daily co-curricular activities along with other famous public schools in England. In the case of a day school, however, the word 'house' refers only to a grouping of pupils, rather than to a particular building. The house system has been common in the state sector for many years. It is attracting increasing attention in public and parochial secondary schools in the United States. Am Anfang eines jeden CI-Projektes steht selbstverständlich eine ausführliche "Besichtigung" des umgebenden Logoareals. Diese gesammelten Logos hier stammen aus der Schweiz. Motive und Elemente, die benutzt werden, sind meistens Dächer in allen möglichen Formen und Abstraktionsgraden. Ich wollte von Anfang an ein Logo, das unmissverständlich den Beruf des Handwerkers kommuniziert. Deshalb sollte es ein Piktogramm werden. Was ist ein Piktogramm? Kurz, es ist ein grafisches Zeichen, das versucht Objekte in der Welt zu repräsentieren. Ferner können sogar Prädikate durch Zeichen visualisiert werden, sofern das gleiche Wort als Substantiv existiert. Beide Konzepte gehen vom gleichen Prinzip aus. Es soll ein "Satz" konstruiert werden, der die folgende, ungefähre Aussage hat: " Machen Dach". "Die Bestandteile der Sprachen sind nach Chomsky (1957) Sätze, welche die Funktion haben, Aussagen über Gegenstände zu machen. Sätze bestehen daher aus einem Satzgegenstand = Substantiv + Satzaussage = Verb. ... Bei einem Vergleich von Sprache und Bild stellt sich die Frage, ob es eine der Sprache entsprechende syntaktische Struktur der Bilder gibt." In diesem Fall steht der Pfeil bzw. der Hammer für das Verb und das Dach ist das Substantiv. Der Pfeil soll die Arbeit am Dach stärker abstrahieren. Variationen, die erörtern sollen, ab wann ein Hausdach als Dach erkannt wird. Bereits in dieser Phase wird neben der Bildmarke ein mögliche Wortmarke platziert. Neben der für das Dach nötigen Erörterung der Dachschräge, wird nach einem passenden Hammer gesucht. Der typische Klauenhammer eines Zimmermanns bzw. Dachdeckers bietet jedoch für den Zweck eines Piktogramms zuviele feine Details. Er muss leider zusätzlich vereinfacht und verfremdet werden. Der vereinfachte Hammer und der richtige Dachausschnitt finden Platz in einem Rastersystem. Das Gestaltungsraster sieht auch eine visuelle Klammer vor - in dem Fall einen Kreis - die das Zeichen zusammenhält und es sowohl nach innen als auch nach außen schützt. Ein Kreis, sofern er nicht rot ist, steht z.B. für Freundlichkeit. Im demselben Rastersystem finden auch die Elemente Pfeil und Dach Platz. Da der Kreis die Eigenschaft besitzt gerne zu rollen, habe ich das Logo nochmal in einer eckigen, jedoch abgerundeten Klammer gesetzt. Jetzt steht das Logo stabiler da - kippt nicht so schnell - und die entschärften Ecken lassen es dennoch freundlich erscheinen. 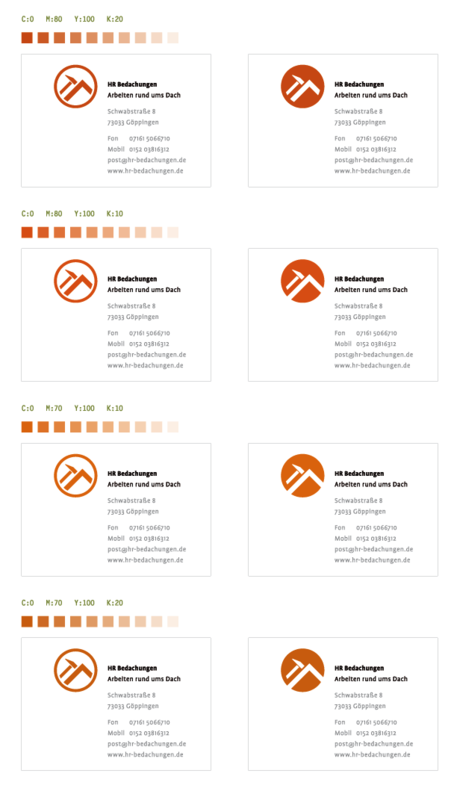 Verschiedene Rahmenstärken wurden ausprobiert, um die nötige Balance zwischen der visuellen Klammer und der eigentlichen Aussage des Logos zu finden. Die unterste der drei Varianten gleicht der ersten oberen im Makrobereich, jedoch wurde hier im Mikrobereich an kleinen Details gefeilt. Da der Dachdecker oft mit "ziegelrotem" bzw. 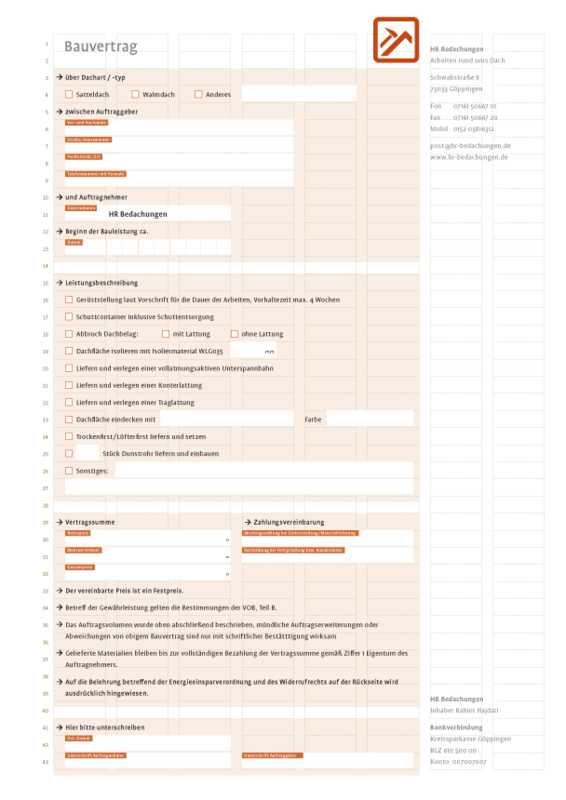 eher orangenem Baumaterial zu tun hat und der konkrete Dachdecker als freundlicher, pflichtbewusster und solider Handwerker gelten will, fiel die Wahl auf die Einfärbung der Bildmarke in orange. Verschiedene Orangetöne, die sich an der Anmutung eines Dachziegels orientieren, wurden ausprobiert. Ausserdem setzte ich jede Bildmarke noch als Negativ um. Eine exklusive Schrift lag nicht innerhalb des geplanten Budgets des Handwerkers und so musste eine passende Systemschrift gefunden werden. In die engere Wahl kamen Schriften wie: Arial, Courier, Helvetica, Lucida Sans, MS Trebuchet, Tahoma und Verdana. Der Geschäftsbrief richtet sich nach DIN 676 mit dem Rhythmus 87/105/105, um dem Formularinhalt mehr Platz zu bieten, da das Anschriftfeld weiter oben steht. Würde es nur beim Geschäftsbrief bleiben, könnte man auch zum Rhythmus 105/105/87 greifen. Da jedoch weitere Formulare, wie ein Bauvertrag, ein Angebots- und Rechnungsformular angefordert wurden und man den Platz für den Inhalt optimal nutzen müsste, wählte ich die erste Variante. 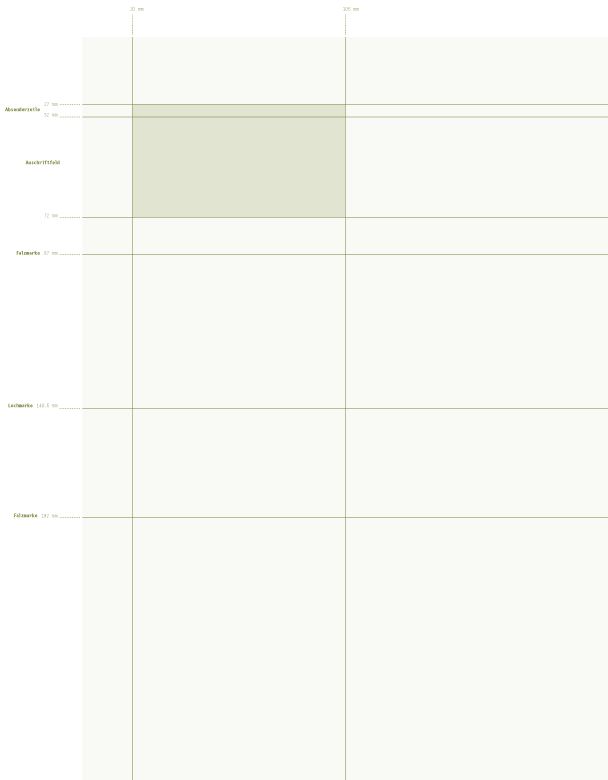 Als ein besonders flexibles Raster erwies sich ein Achtspalter. Das Zeilenraster orientiert sich an Schreibmaschinenstandards, um auch in Microsoft Word "problemlos" ausgefüllt zu werden und ist ein Drittzeilen-Grundlinienraster. Linienartige Formulare: die im direkten Vergleich besser lesbare Variante, da keine farbliche Hinterlegung vorhanden, wirkt zwar deutlich leichter, trennt jedoch die inhaltlichen Bausteine nicht so deutlich voneinander. Hier zu sehen der Vorschlag eines linienartigen Formulars. 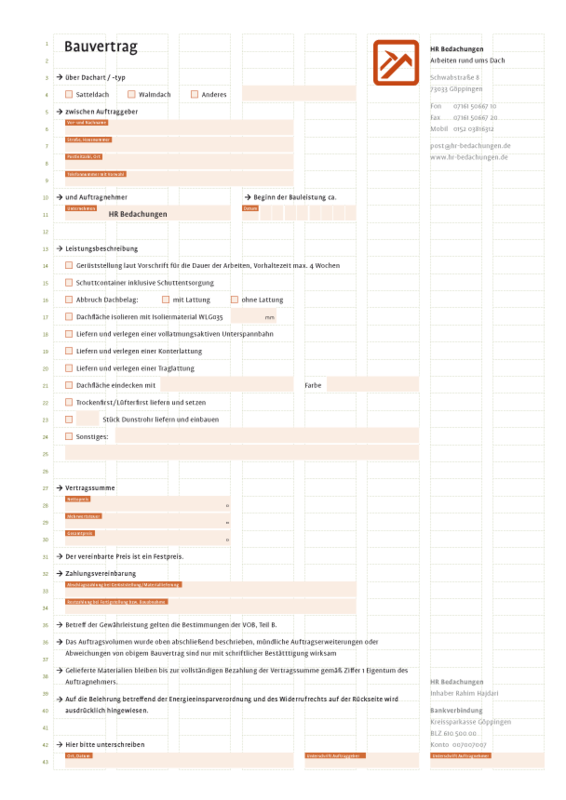 Ein flächenartiges Formular trennt inhaltliche Module sehr gut voneinander. Sofern man vorsichtig eine helle Hinterlegung wählt, sollte eine vollends ausreichende Lesbarkeit gewährleisten. Ein Negativ eines flächenartigen Formulars rückt die einzelnen "interaktiven" Felder zwar in den Vordergrund, jedoch geht der visuelle Zusammenhang der Inhalte verloren. Das flächenartige Formular in einer modifizierten Variante, die das Farbklima des Erscheinungsbildes zusätzlich verstärken soll. "Bei offenen Fragen muss man sich mit zwei Problemen beschäftigen. 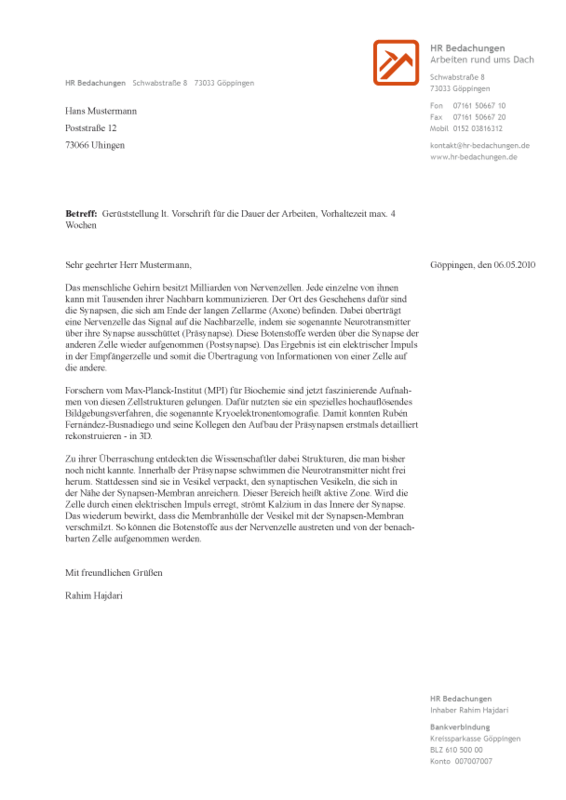 Zum einen mit der Anordnung der Frage zum Schreibfeld, und zum anderen mit der Gestaltung des Schreibfeldes selbst. Frage und Schreibfeld kann man entweder nebeneinander, übereinander oder untereinander anordnen. Jede Anordnung hat ihre Vor- und Nachteile. 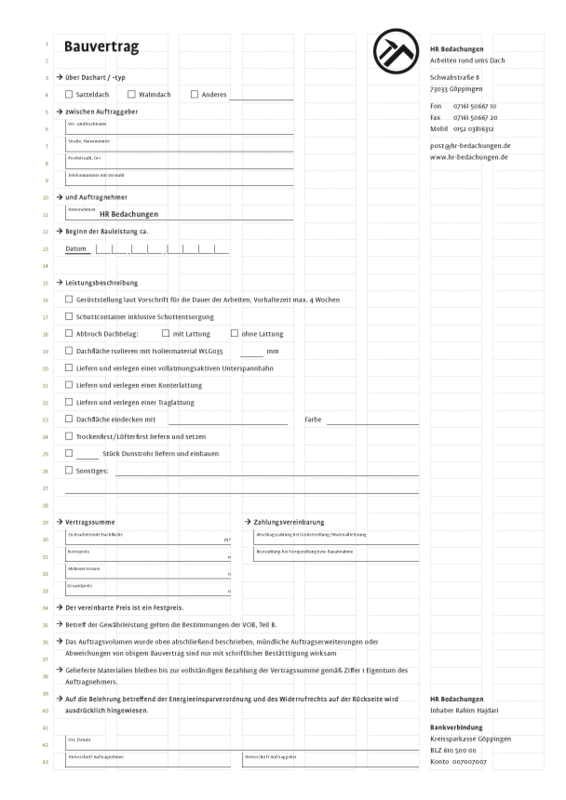 Das Schreibfeld kann mit Hilfe von Linien, Rahmen, Zellen oder Flächen dargestellt werden. Dies ist eine Entscheidung, die das gesamte Erscheinungsbild des Formulars bestimmt." Im Fall des Bauvertrags kamen eigentlich nur zwei Möglichkeiten in Betracht, die Fragen unterzubringen. Da nämlich manche Fragen sehr lang waren, konnten sie nur entweder über oder unter dem Schreibfeld positioniert werden. Im Beispiel steht die Frage gleichzeitig über und im Schreibfeld. Einerseits wird der Raum zum Aussfüllen verringert, andererseits ist es nicht ganz klar, ob man darunter oder daneben schreiben soll, oder man gar die Frage überschreiben darf. Hier ein Besipiel mit der Frage unterhalb des Schreibfelds positioniert, wo ausserdem die Stellung der Frage ausserhalb des Schreibbereichs zusätzliche Klarheit schafft. Die "Frage unterhalb" in dieser Variante bietet zum einen genügend Abstand und Trennung zum Schreibfeld und hat den positiven Effekt, sich mit dem angedeuteten Schattenwurf der Ankreuzkästchen in die gleiche visuelle Sprache wie diese einzuordnen. Dieses Beispiel funktioniert nur dann gut, wenn die Fragen kurz bleiben, denn man wagt es eher weniger die Frage zu überschreiben - selbst wenn, würde womöglich ein Teil der Antwort unleserlich bleiben -, die Felder müssten >18pt angelegt werden, da zum Ausfüllen unterhalb der Frage die meisten Leute eine zu große Schrift oder einen zu fetten Stift haben. Das Logo hat einen rechteckigen Rahmen, sämtliche Abstände und Strichstärken sind sorgfältig ausgesucht. Das Farbklima soll Freundlichkeit zum einen und die Nähe zur Bausubstanz, mit der sich ein Dachdecker meistens beschäftigt, zum anderen, unterstützen. Die Bild- und die Wortmarke sind so miteinander kombiniert, dass jederzeit eine Erweiterung des "Gespanns" um weitere Metadaten innerhalb der dafür vorgesehenen Klammer, durchgeführt werden kann. Das Logo wurde rastergerecht auf einer Visitenkarte der Scheckkarten-Größe 85 x 55mm positioniert. Das Briefpapier folgt einem Raster, das als kleinstes Unit ein 12pt x 12pt großes Quadrat hat, das wiederum vorher schon als Rasterelement bei der Logo-Gestaltung und der Visitenkarte benutzt wurde. Somit wird eine visuelle Klarheit, Einheitlichkeit und Ordnung garantiert. 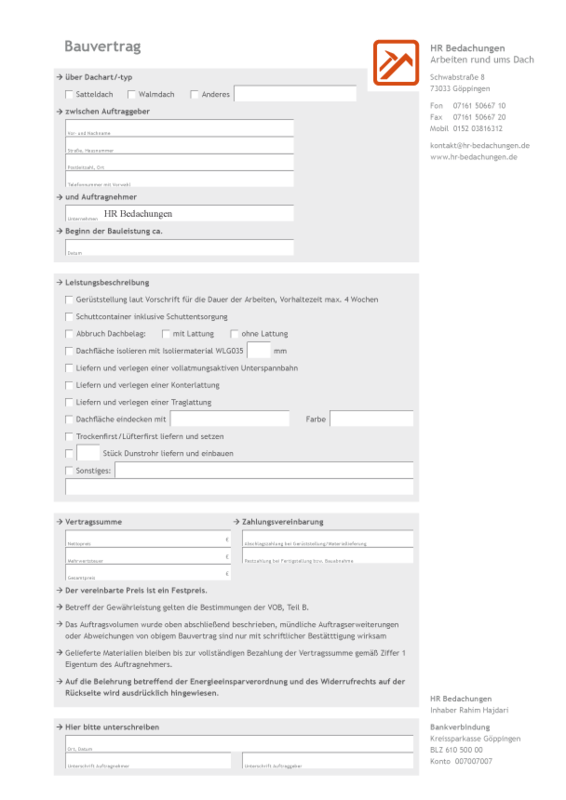 Der Bauvertrag folgt dem gleichen achtspaltigen Raster, wie das Briefpapier auch. Das Raster erfüllt desweiteren die Schreibmaschinenstandars, d.h. man könnte es auch mit einer Schreibmaschine ausfüllen.